Climbers elbow has really been interfering with my climbing for quite a while now. I’ve come to terms with the fact that it will probably never completely go away, but it has really caused trouble in the past and continues to be a problem from time to time. I am starting to get on top of this now, so I figured I’d share what does seem to help in case you have had similar trouble yourself. It’s worth pointing out that I’m not a doctor, or physiotherapist so if you are having trouble yourself you should consider consulting a professional. Climbers elbow is fairly noticeable due to persistent pain around the knobbly part on the inside of your elbow. As a very basic explanation, climbers often end up with a muscle imbalance in their forearms because our hands face out an pull, instead of in. It is at this point a number of muscles used for climbing are anchored, so with very hard climbing or training crimps and lock-offs we can end up with sore elbows. The first thing to understand if (like me) you have had climbers elbow for a while is that ice, anti-inflammatories and rest are probably not going to be enough to fix the problem. We actually need to strengthen the weaker parts of the forearm instead. Now this is where things tend to go wrong for me as I’m not as disciplined as I should be, but the more often you can actually combat the imbalance, the better off you will be. According to current research, the resistance in the exercises used to treat climbers elbow and correct the imbalance should be enough to provoke mild pain in existing injuries. So if you aren’t feeling the sweet and excruciating pain of the exercise, you aren’t doing it right! There are a few key exercises that I use, all of which involve eccentric loading. This means the muscle is lengthening under load instead of shortening. The first is a simple forearm stretch. I do this kneeling on the floor with my hands flat and facing me with forearms out, then slowly lean back and hold for around 20 seconds. If you are sitting at work, you can get a similar result by pushing against the edge of your desk with your fingers and slowly lowering your wrist. The next involves a dumbbell with 2-3 kgs of weight at one end. With your arm resting on your knee, hold the dumbbell straight in the air with your thumb up. Now slowly lower the dumbbell towards the outside of your knee, counting to 5 as you go. Stop at 90 degrees and use your other hand to help bring the weight back up (you don’t want to make this part difficult). Repeat this for 10-15 reps on each hand. Finally, my go-to treatment is to use the Theraband bar. These bars come in different thicknesses, which correspond to the amount of resistance they apply. I’d recommend a green bar for most people but have started using a blue bar (which offers the most resistance). These come with their own set of instructions, but I find the following useful. These things were designed by a nice guy named Tim Tyler and the exercise for climbers elbow is called the reverse tyler twist. There is no good way to explain this, so watch the video by clicking on the header image to see how it’s done. 10 reps each side is a pretty good number. I actually don’t have a name for the next one (feel free to set me straight in the comments), but I’m calling it the motorbike because it feels like you are revving the throttle or something… Again it’s difficult to describe, so check out the video for more details. I also like to add some pronation exercises by holding the bar out in front of me, palms up and bending the flex bar in half. The trick here is to avoid using your shoulder and just twist your forearm from the elbow. 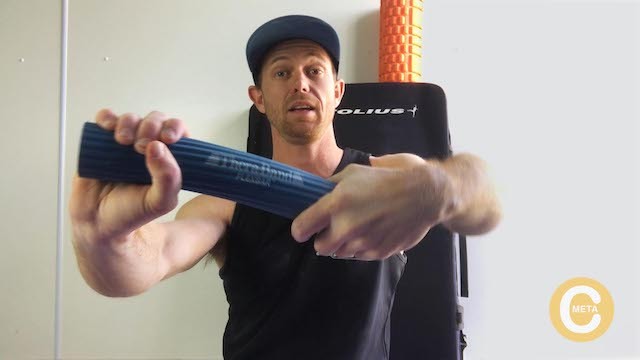 This has helped me with a bit of rotator cuff trouble as well, so I like to keep it in the mix. So that’s it. Very simple stuff and it really doesn’t take too much time to do however, it does require discipline to do it consistently. To get on top of things you probably want to be doing these exercises daily until the pain subsides, then move to around 3 sessions per week to keep on top of things because it never truly goes away. Hope that this is helpful, if you have had trouble in the past I’m keen to know what has worked for you as well. Remember, train hard, climb smart!